it’s a bit of a lukewarm time here on my blog, but of course i crochet and luckily i have some photo’s to share with you. with the winter version, i am already well progressed. i’ll line the bag with cotton bags that i got -years ago- at a shop of cora kemperman, a dutch fashion designer. 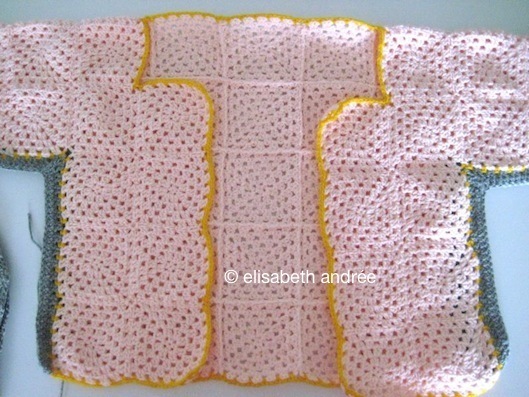 the peach-colored squares form a vest and i have crochet an orangey border around it, while the sides are medium gray. 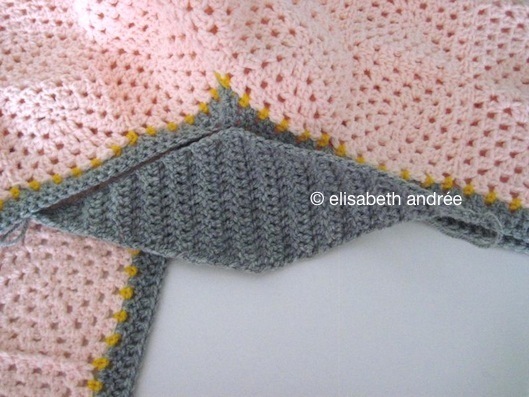 for the sections under the arms i have crocheted diamond shapes in the same shade of gray. after i have attached them, i can work on the lower ends of the sleeves and the vest. it’s a bit puzzling, but i want to bring it to a good result. Categories: crochet, wip | Tags: apparel, bag, handbag, vest | Permalink. for a long time i wanted something made of black and pink yarn, for some reason an exciting combination. now proved to be too exciting for me because i have combined it with a very light and a dark shade of gray. the sleeves are fitting great and because they are a bit too long, i can hide my hands in the cuffs when i am cold. i found it very difficult to properly describe how i crocheted it. hopefully the pattern is clearly enough. for this pattern you can use any yarn you like, if it is thicker or thinner than my yarn, only adjust the number of stitches. this is how i have made it. the basis is 21 stitches (16 + 5 chain) with a multiple of two. i started with 79 chain and made the first dc in the seventh chain from hook. from here you can follow the diagram, but first some pattern notes. 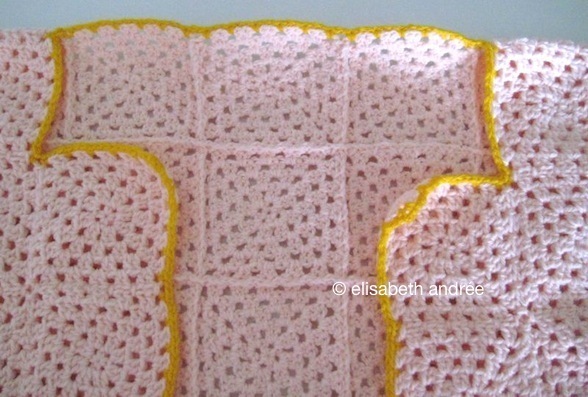 make the second part the same way as the first part, end with a row of post stitches and chains. attach the yarn on the wrong side at a long side of your scarf and start with 3 ch, then you crochet 1 dc in the space of the first dc, 1 ch, 1 dc in the space of the next dc, repeat this until you reach the end of this side, 3 ch and turn. 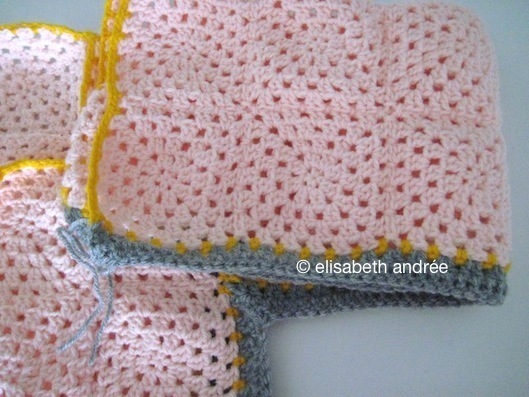 crochet a row of post stitches and chains till end of row. fasten off. repeat these 2 rows on the other long side of your scarf. note to row 1: the spaces between 2 dc’s serve as buttonholes. weave in all ends of yarn and sew buttons down one long side and then you’re done. hope you like the concept of this scarf-button-sleeves! Categories: crochet, tutorial | Tags: apparel, scarf, shawl, sleeves, tutorial | Permalink. let’s continue with the happy sleeves. you missed part 1? fold the two sleeves in half lengthwise and with the right side up and the last row on the top, it looks like this. you can now see and mark where you going to make the cuffs. 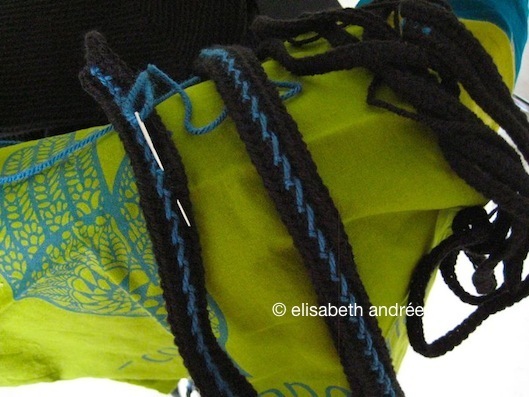 attach your yarn the same way as you did for your cuffs, but on the other side of the sleeves. row 2 and further rows are the same as the pattern for the sleeves. the edge all around you make by crocheting sc evenly spread. sometimes you make two stitches in a space, sometimes one. and in the part under your armpit you crochet together three stitches. i have crocheted three rows and the last two rows, i worked in the back loops only. i hope the tutorial is clear enough and that you now have a garment that you like to wear. Categories: crochet, tutorial | Tags: apparel, happy sleeves, sleeves, stitch pattern, tutorial | Permalink. hello here i am again. this tutorial is much and much larger than i previously had thought, so again you have to do with a pattern in several parts. hopefully it’s not a too big problem for you? last winter i often worn two things especially against the cold, whether i was working at my computer or i was reading in bed. i call them my happy sleeves. ​these almost clownish sleeves i most often worn. the other sleeves i made ​​of squares with a collar and a border all around it and with wide cuffs. because the type of yarn you can not clearly see that it is made of squares. first decide whether you want long or short sleeves. with long sleeves you measure from wrist to wrist (this is your total length of your back, shoulders and both arms), i wanted three-quarter sleeves, but you can also make yours shorter. i’ve written this pattern for three-quarter sleeves but you can customize it yourself. decide the width you want, the width must leave you enough space for your armpits and upper arms (it must be wearing comfortable, you don’t want it to be stuck under your armpits and it’s nice when you just can move your arms). 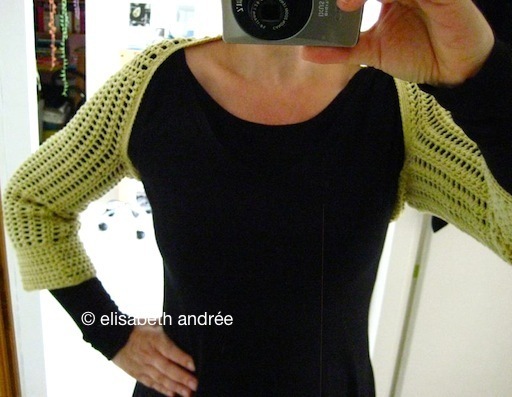 you crochet the sleeves in the length and not the width. first you make both sleeves and then the back in two parts. and a stitch which i do not know whether that has a name, i describe it later in the pattern and you can see pictures of it. this is the scheme for the first row and it is your guideline to calculate how much chains you need for your size. you increase the number of chains per 2. 84 chain + 3 ch for beginning tr (for the beginning tr you should start with 4 ch but i like to crochet 1 chain less, please feel free to do what you normally do). row 2. please use the photo’s as your guideline, they are more likely clearer than my text. insert your hook in the first tr of the previous row and draw up a loop, insert your hook in ch 1 space and draw up a loop, insert your hook in the next tr and draw up a loop, (yo and draw through 2 lps on hook) 3 times, ch 1, *insert your hook in next tr and draw up a loop, insert your hook in next ch 1 space and draw up a loop, insert your hook in next tr and draw up a loop, (yo and draw through 2 lps on hook) 3 times, ch 1*, repeat between * * until end of row, the last loop you draw up through the beginning ch (see photo), 3 ch, turn. row 3. 4 ch (= first tr and 1 ch), 1 tr in next tr, *1 ch, 1 tr in next tr*, repeat between * * until end of row, ch 2, turn. repeat rows 2 and 3 until you have the size you need, end with row 2.
on the photo’s you can see how the wrong side looks like. you have several threads, the pins show you where to insert your hook to make the next treble. just repeat the pattern to make your other sleeve. in the next post we continue with the cuff, the back and how to put together the sleeves. see you then! Categories: crochet, tutorial | Tags: apparel, happy sleeves, sleeves, tutorial | Permalink.